Fritzi represents clients in the sale and acquisition of businesses, capital raising transactions and in connection with the review and negotiation of business contracts. She also advises public companies on reporting obligations and has represented issuers in public and private offerings of equity and debt securities. While in law school, she served as a judicial intern to the Honorable James E. Shadid, U.S. District Court for the Central District of Illinois. During the fall of 2006, Fritzi participated in a foreign studies program at the University of Parma in Parma, Italy. She also spent nearly two years teaching English language to adults in Nagoya, Japan for a leading English-education corporation prior to attending law school. 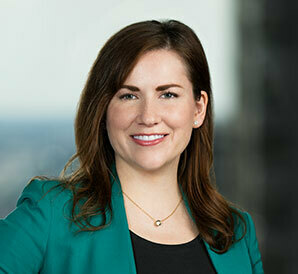 Prior to joining the Firm, Fritzi was an associate in the corporate and securities department of a Chicago-based law firm. Represented First Busey Corporation (Nasdaq: BUSE), in connection with its acquisition of The Banc Ed Corp.
First Busey Corporation Acquires First Community Financial Partners, Inc. Representation of First Busey Corporation (Nasdaq: BUSE) in connection with its acquisition of First Community Financial Partners, Inc. (Nasdaq: FCFP). First Busey Corporation Acquires Mid Illinois Bancorp Inc. Representation of First Busey Corporation (Nasdaq: BUSE) in connection with its acquisition of Mid Illinois Bancorp Inc.
Guaranty Federal Bancshares, Inc. (Nasdaq: GFED) Aquires Hometown Bancshares, Inc. Represented Guaranty Federal Bancshares, Inc. (Nasdaq: GFED) in connection with the merger with Hometown Bancshares, Inc. Represented ATBancorp in connection with the acquisition by MidWestOne Financial Group, Inc. (Nasdaq: MOFG). "Rule Changes Clarify Judges’ Ability to be Speakers or Guests of Honor at Fundraising Events,"
Guaranty Federal Bancshares, Inc. Completes the Acquisition of Hometown Bancshares, Inc.
Ridgestone Financial Services, Inc. to Merge with Byline Bancorp, Inc.